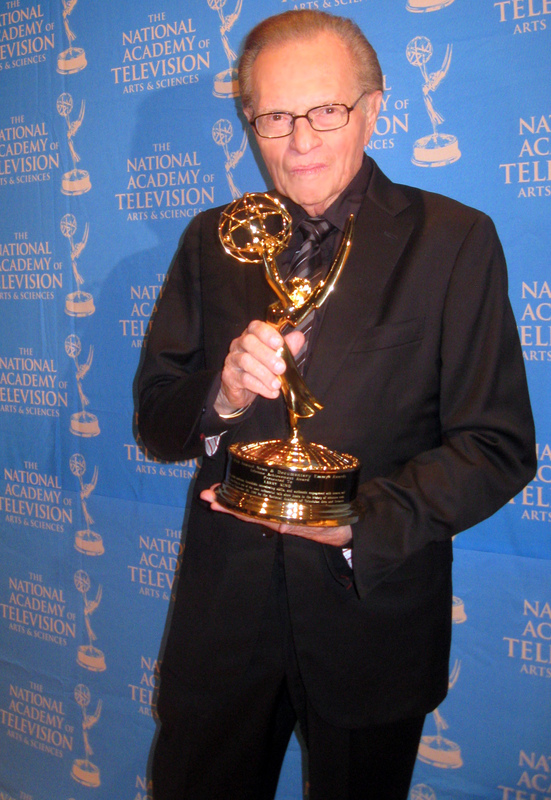 Larry King Receives Lifetime Emmy, Wants to be Frozen & Loves The LA Dodgers! Larry King wants to be frozen and is considering being a part owner of the LA Dodgers- yeah, the iconic broadcaster has been busy lately folks! But let’s first let’s talk about one of the best listeners and observers in television and radio receiving his Lifetime Achievement Emmy Award. The world-famous broadcaster with the gift to get people to open up about their lives, was recently honored by the National Academy of Television Arts and Sciences with a Lifetime Achievement Emmy Award for his five decades of service in the broadcasting and radio industries. 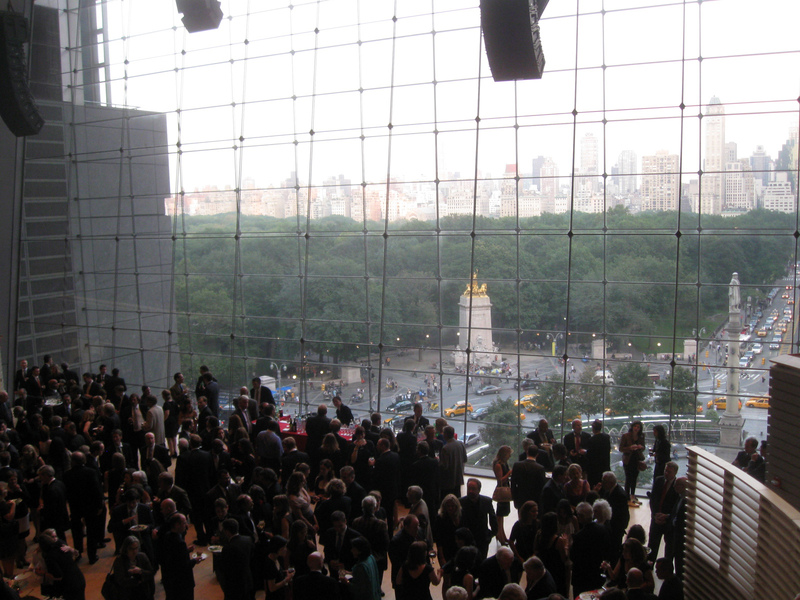 The gala took place at the famed Jazz at Lincoln Center venue in NYC. The award was presented to King by NBC highly popular newsman, Brian Williams. CNN’s “Larry King Live” was the highest rated and most watched show on the network for over two decades bringing in world-wide famous celebrities, leaders and politicians, many of whom were first time guests on the Cable News Network. Even after King retired in December 2010, the suspenders- wearing family man is still in demand with celebrities, world leaders and politicians. King’s recent and exclusive interview with Johnny Depp for CNN is a prime example of the kind of special appeal that King has with celebrities. Friends who came to celebrate the honor included world-famous CNN medical host Dr. Sanjay Gupta (Gupta was just as kind and humble in person as he appears on TV folks!) several CNN producers, past employers and many, many family and friends. The broadcasting legend wears many hats- best-selling author, father, husband and friend who shows no signs of slowing down at 78. King spent 25 years at CNN where he conducted over 50,000 interviews while boosting the network in ratings. In his spare time (does he even have any?) he oversees his Larry King Cardiac Foundation, an organization that helps fund people in need of heart surgery. King suffered a major heart attack in 1987 which required bypass surgery. His own father passed away at the age of 44 of a heart attack. For more information on the foundation, visit http://www.lkcf.org. With thousands of interviews, countless stories and best-selling books ( his book Larry King, A Remarkable Journey is a must read folks! ), King has for decades kept the world informed through his thought-provoking, laconic and non-confrontational ways of interviewing everyone from world leaders to ordinary citizens which grace, style and sophistication. I have been a long time admirer and have so enjoyed watching the legend get the most reserved, shy and reclusive individuals to open up to him about their lives, personal issues and struggles. King’s intelligent interviewing style has appealed to millions of viewers across the world and to his guests that often want to come back again and again knowing they will be treated fairly. 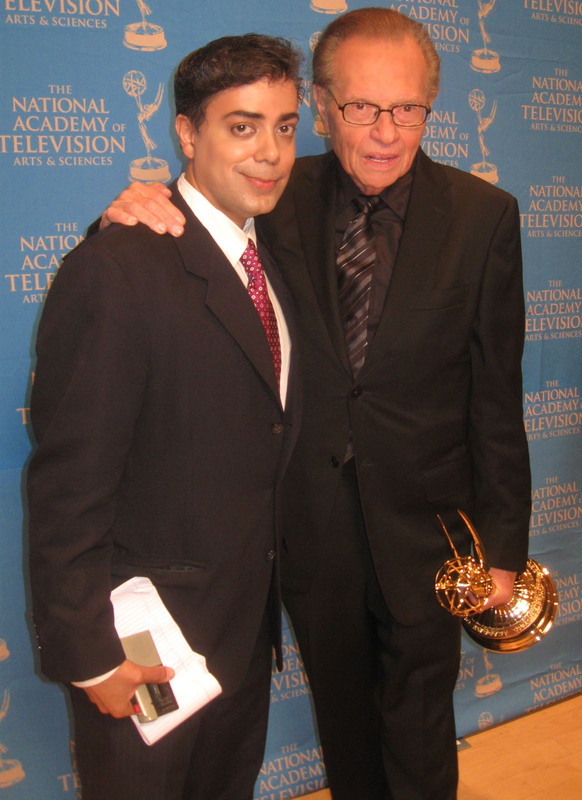 Larry King spoke exclusively to The Ravi Report about his win and a bit about his personal life as well. RR: Mr. King, it is indeed an honor and a privilege to meet you. Congratulations on the Emmy. It is so well deserved. Please tell me what your secret to such a prodigious career has been? LK: Thank you. Well, I think Bill Clinton said it best in the program tonight…The New Yorker did a story on me and they called it “Street Questions”…I was always every man… I didn’t go to college…I was just a guy asking the questions…I think people associate with me...I think the guy on the street would have said ” I would have asked that”…I don’t think I was ever above anyone. RR: A demanding and ambitious career often comes with both successes and sacrifices. Looking back now, is there something that you felt you sacrificed for the sake of your rewarding career? LK: Well, for a long time and for those that know me…honestly, I was not a good father. I put too much emphasis on work and I learned a lesson for it. Now, I have two little children that I spend more time with. Nothing is more important than family. RR: It sounds like family time is very imperative to you. LK: Everything else is secondary-children and your wife are first. You love your children no matter what they do or no matter what happens to them. Your child becomes President of the United States or ends up in prison, if you are the father of either one, you love them both the same. The ravishing Shawn Southwick-King was by her husband’s side during the honor and summed up her own personal thoughts about King in one sentence. SSL– We are each others strength and that is so important to me. 1. Born November 19, 1933 in Brooklyn NY. 2. When King was 9 years old, his father Edward Zeigler died of heart disease. The family had to struggle financially and the death effected King emotionally. 2. Changed birth name Lawrence Harvey Zeiger to Larry King during his first radio show in Miami in 1957. 3.King married 8 times, twice to the same lady. Current wife is the beautiful Shawn Southwick-King mother of their two children Chance 12, and Cannon age 11. 4. “Larry King Live ” on CNN became the first international TV call-in show and the highest rated talk show on the air for years. 1. The Peabody Award for Excellence in broadcasting for both his radio (1982) and television (1992) shows. 2. King won ten CableAce Awards for Best Interviewer and for Best Talk Show Series. 3. In 1989, King was inducted into the National Radio Hall of Fame and in 1996 into the Broadcasters’ Hall of Fame. 4. In June 1998, King received an Honorary Degree from Brooklyn College, City University of New York for his life achievements. Ok, now for the frozen part. King is still very active with CNN and is doing celebrity specials among other projects for the network. In his first show entitled “Dinner With The Kings” that aired on Dec. 4, the legend sat down with wife Shawn and celebrities Conan O’Brien, Tyra Banks, Shaquille O’Neal, Seth MacFarlane, Jack Dorsey, Quincy Jones and Russell Brand to discuss everything from insecurities, friendships to well…being frozen. “I want to be frozen on the hope that they’ll find whatever I died of and bring me back,” Larry King tells his guests at his swanky Beverly Hills home. Regarding the L.A. Dodgers and ownership, the life long fan and season ticket holder has offered a bid as part of an investor group to possibly own the franchise. It would be King’s first ownership of a professional sports team. The journey continues and for one energetic Larry King- it gets even better! For those that don’t know Nigel Barker well, there is really only one thing that you need to know about him-the man cares. Period. Plain and simple. Be it to help select America’s Next Top Model where Barker serves as a judge for several seasons or as a humanitarian, trying to save the seals from being butchered or bringing awareness to the severe living conditions of the people of Haiti, the multi- talented photographer, celebrity judge and world famous lensman just cares about people and humanity no matter what. Nigel Barker and beautiful wife Christen Chen at Edeyo charity event at Milk Studios. That’s why it was no surprise to see over 800 people on January 8 attend the glamorous charity event unveiling Nigel’s newest exhibit “Hait:Hunger & Hope“at the prestigious and world famous Milk Studios in NY. (www.milkstudios.com). Nigel along with his stunning wife Christen celebrated with friends, guests & celebrities who came to support and view Nigel’s thought provoking photos from his recent trip to Haiti, a place where poverty is as common as a yellow cab in Manhattan. The charity event raised thousands of dollars as the beautiful people of NY came in droves and braved the bitter cold to help the celebrity photographer celebrate his new exhibit which ran until January 13. The exhibit took guests inside the world of many Haitians hopeful for change. The event was to benefit “Edeyo” (www.edeyo.org) an NY based organization that helps raise money for improvised children in Haiti. The benefit was attended by many well known people from the fashion, arts, music and business industries that came to support the well loved photographer. Nigel and his group travelled to Haiti last year during the food riots and documented what he saw with exclusive photographs and a film. The pictures were on display throughout the studio in larger than life sized prints, featuring some of the most beautiful children and people from Haiti I have ever seen. Barker captured the essence of how the Haitians live and how much they are in need of help from others. The daily struggles, the hardships and the glimmer of hope in the eyes of the children, were all captured by Nigel in his journey to Haiti. I have known Nigel for years and when he wants to do something, he gets it done. He is very supportive of many organizations and continues to bring awareness to serious issues through his ability as a top lensman by capturing the essence of the subject matter from anywhere in the world he travels to. He tells a story through his camera, a special talent that only a few have and can utilize effectively. From the Nigel Barker "Haiti: Hunger & Hope" collection. For more information, do check out www.edeyo.org for a complete look at Nigel’s amazing work and how you can help the people of Haiti have a better life.